Coral, semi-double, early-midseason, 40" tall, hybrid. 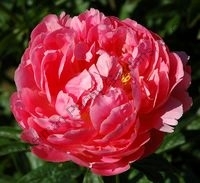 Very vigorous, large cup-shaped flowers. 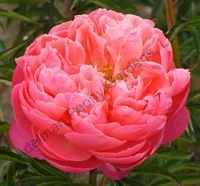 Exotic deep coral that fades to a softer color on opening. May need staking. APS Gold Medal Award 1986. 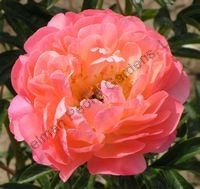 Coral-peach, single, midseason, 34" tall, hybrid. 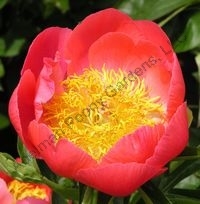 Deep coral cup-shaped flowers enhanced by a center of golden stamens. Our floral arranger's favorite! Award of Landscape Merit 2009. Coral, semi-double, early, 32" tall, hybrid. 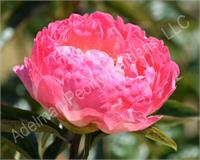 The petals have ruffled edges that increase the flower fullness. Fades from coral to ivory. A spectacular coral flower! APS Gold Medal Award 2003. Coral, semi-double, fragrant, early, 34" tall, hybrid. Opens a redder coral than other corals, with notched petal edges and a center of yellow stamens. APS Gold Medal Award 2000. Award of Landscape Merit 2009..
Coral to pink, semi-double, early, 40" tall, hybrid. Found as an open-pollinated Coral Sunset. It received "Seedling of Distinction" recognition at the 2012 APS exhibition. © 2019 Adelman Peony Gardens, LLC.